This pattern was completed using a combination of ladder stitch, single and two drop brick stitch (as with many of my other patterns). A foundation row is created using a ladder stitch with two beads in each row. The rest of the bead work is completed using either a single or two bead brick stitch. It’s another really good beginner’s project because there are no complicated increases or decreases. Cut down on that overflowing seed bead stash with this collection of 11 seed bead patterns and projects. In this jewelry making guide, you’ll find a brick stitch pendant pattern featuring long, looped beaded fringe. Patterns including making a brick stitch ruffle, dainty brick stitch earrings, Crystal Flower brick stitch ring and Santa earrings brick Brick Stitch Seed Bead Patterns including circular brick stitch pendant, brick stitch earrings, circular brick stitch earrings, brick stitch ruffle, brick stitch. 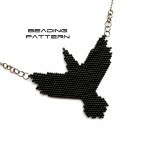 First up is my new Corvus beading pattern. Some of my regular blog followers will remember this design from a necklace that I made some time ago but it’s only now that I’ve been able to get the beading pattern finished! This silhouette of a crow or raven (both members of the Corvus family, hence the name) can be stitched in either peyote or brick stitch. I’ve got a soft spot for brick stitch. It was the first beading stitch that I taught myself that I actually understood, and for a while, I made all of my amulet bags with brick stitch instead of peyote! Even after I learned how to love peyote stitch, I still found myself coming back to brick stitch for the way it can be used to create simple shapes, elegant curves and dramatic drops in my beading designs. Those lovely points in my Back to Byzantium necklace were created with brick stitch! Another popular beading stitch that is suitable for beginners is the Brick stitch. These Japanese inspired earrings were created using Brick stitch. Even the stud covers were created with Brick stitch. 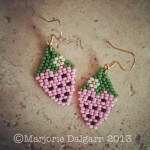 It is actually a fun technique because you can create patterns, similar to how these earrings were created. The combination of colors and the flowers with a picot edge made it look like a fan. I finally wrote out the “Raindrops on Rainbows” beading pattern for you guys. The pattern is done in brick stitch. The finished rainbow could be used as a necklace charm (as pictured below), large earrings, as a little decoration on your purse….or anywhere else that would benefit from a cheerful little rainbow. I bead, therefore I am.